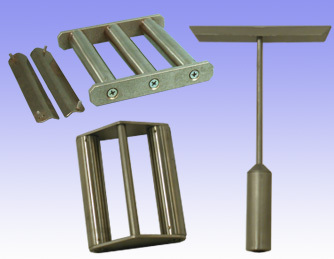 Made with strong rare earth magnets and stainless steel sleeves, our drop-in magnet assemblies are made for easy removal to clean any trapped contaminates. The Sight Glass Magnet drops into the loader hopper and is located in the center of the sight glass. The material flows over and around the magnet. The Loader Hopper Magnet drops into the loader hopper and material flows over the magnets to attract contaminates. The 6" Hopper Magnet comes with stainless rails to install into the bottom of the feeder hopper. This traps contaminates that could damage your molding machine.